Alfie Smith sees brother Alex for the first time after his operation. Battling Alfie Smith has been given a boost to his recovery by being reunited with his brother. For the first time since he underwent surgery to help him walk again, the Hartlepool nine-year-old was reunited with his brother, Alex, over the weekend. Matt Haycox visits Alfie Smith in hospital. The seven-year-old was allowed to go to visit his sibling at Leeds General Hospital after more than a week apart. The boys’ mum, Annie Stalley, said Alfie was really excited about seeing Alex again. Alfie, who has cerebral palsy, underwent selective dorsal rhizotomy (SDR) at Leeds General Hospital. 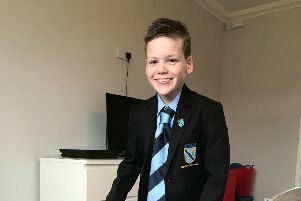 The procedure involved Alfie’s back being cut open so tests could be carried out on the nerve fibres running from the muscles to the spinal cord to find which ones most reduce his mobility, then dividing them to reduce stiffness and spasticity. The operation took between five and six hours. The youngster was also visited by Matt Haycox and his daughter, who took him some toys and gifts. Matt, who lives in Leeds, donated £16,000 towards helping the youngster walk again. She said the youngster has now been moved to another ward until Monday when he will be released after his first physio session. She said her son was in a unbearable pain after the epidural wore off and it was very distressing. However, she added: “It hasn’t been an easy journey, but we are still so grateful for this one and only opportunity to change Alfie’s life.